CAPE COD, Mass. – An expanded playoff format and 10 seven-inning doubleheaders highlight the 2010 schedule for the Cape Cod Baseball League, announced today by CCBL Commissioner Paul Galop. CAPE COD, Mass. -- With the wet and rainy 2009 season in the rear-view mirror, the Cape Cod Baseball League Board of Directors and Executive Board committees are preparing for the 2010 season, and looking to help out over the holidays. Hyannis MA -- The Cape Cod Baseball League and JFK Hyannis Museum have partnered to create this stunning tree that is on display at the "Spectacle of Trees" at the JFK Hyannis Museum this Friday and Saturday. by Diane Troy, Sue Horton and Ann McIsaac. Stop in and view 21 magnificent trees and vote to win our tree. It is loaded with $900 -worth of food- related certificates to grocery stores and restaurants. The "Tree that Keeps on Giving" enables the winner to use the certificates and gift cards themselves or give them as gifts or donate them to a local food pantry. Great idea in the truest spirit of Christmas. 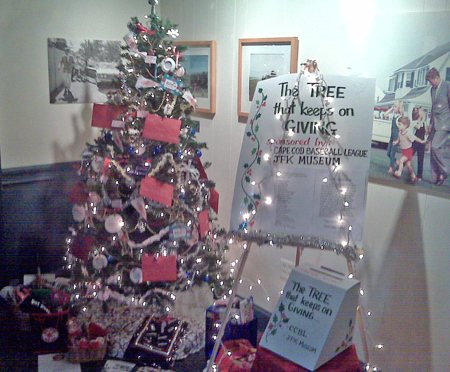 The tree is supported by each of the 10 Cape League teams and was created by Diane Troy, Sue Horton and Ann McIsaac of the JFK Hyannis Museum gift shop. The 21 trees on display each represent a non-profit. All the proceeds from the raffle ticket purchases go to that organization whose tree you "vote to win". This is the third year the Cape League has participated. Last year the Cape Cod Baseball League tree raised $850. The Cape Cod Baseball League America's League "Where Millionaires Are Made"
CCBL is "Where Millionaires Are Made"